I took some digital-free downtime through the holidays, making the conscious decision not to add to your overflowing inbox of donation requests, year-end sales, special offers, holiday gratitude, and other platitudes. It’s not that I am not incredibly grateful, especially for you—a valued reader of my work. You see, I wanted my reprieve to also be yours; more quiet and stillness, more ‘human’ connect time, and less noise… at least coming from me. In fact, the typically stressful holiday season, leading into a new year, may be the worst time to recalibrate one’s priorities and embark on fresh and sustainable personal goals. Resolutions related to career growth and money, are certainly popular—but those connected to improving one’s health and fitness are perennial list-toppers. Lifestyle and behavioral-change resolutions are typically the first ones shattered by mid-January. They are impulsive, not well thought out, and therefore fleeting. Powerful, sustainable change takes time. It’s incremental and must be phased in over weeks and months, via consistent and smart, implementable steps. It’s rare for real health-change to magically coincide with a new calendar year because real, meaningful change, in service of health creation typically consists of a multitude of smaller pivots and modifications. Combined, over time, this helps create the largest net sum of healing benefits. ‘Resolution’ is synonymous with resolve, determination, tenacity, perseverance, and purpose. 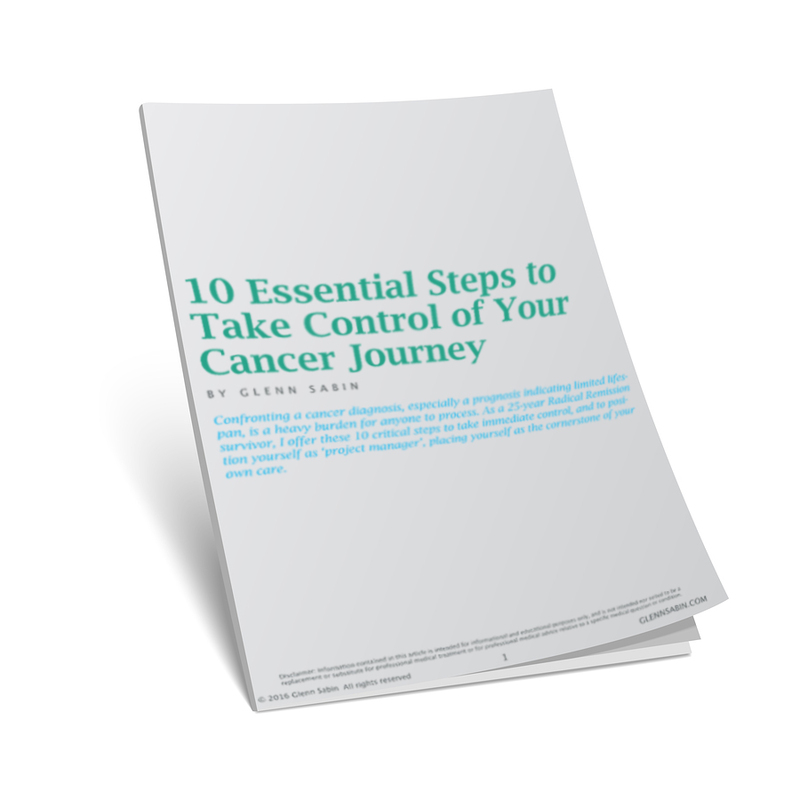 These are incredible attributes for anyone to possess—especially those faced with a life-challenging or potentially life-limiting health condition such as cancer. After coaching hundreds of people hosting various types of malignant disease, I’ve learned to meet folks where they are. I am fortunate that, when someone finds me, they are often ahead of the curve in terms of being proactive in the management of their own care. Many people are looking for more answers to support their own brand of taking control and the singular quest to become the center of their own care. I’ve learned that each one of us is incredibly unique—physically, emotionally, and psychologically. We have different interests, challenges, limitations, world purviews, and goals. So, no ‘one size fits all’ New Year’s resolution—or two or three resolutions—can magically mesh neatly with your individual needs as a cancer survivor. Each person needs a custom plan, and January 1 has nothing to do with it. Resolve to evolve, to learn, to grow… to be open-minded to the myriad choices you have in taking control of your health, and your innate capacity to heal—regardless of any calendars or particular resolution. When I assess a survivor, someone with a reoccurrence, or somebody wanting to prevent cancer, it involves the review of an extensive intake form. But this information is simply a jumping off point to numerous areas of discussion, including one’s lifestyle, as well as one’s medical, physical, psychological, and emotional constitution. I want to know what type of tumor a person has. But I am more interested to learn what type of person you are, as host to a tumor, because… we are each an n of 1. My coaching process is quite comprehensive. There is considerable intake time invested by both me and my clients before a session even takes place. Completing the intake questionnaire and food journal requires significant thought and candor. A lot is packed into a 75 min session, but it is not rushed. Typically, many recommendations are made. As a whole, it can be overwhelming. But taken step-by-step, with a phased-in approach over time, clients can make progress in the short term, while focusing on larger goals requiring consistency. All habits—bad and good—form by repeat behavior, not from fleeting resolutions to mark a new calendar year. Resolving to evolve is by far the best step toward growth in any area. When faced with a life-changing or life-limiting diagnosis, wholesale behavior change need not happen overnight. Don’t be the harried hare that fades during the last week of January; rather, allow a consistent pace of learning. Start where you are and grow. Resolve to evolve.